Once the app is installed, simply fire it up and it should immediately measure the rate of charge. In order to figure out how fast the device is being charged, simply multiply the voltage by the amperage to derive the wattage. In this case, the smartphone is drawing 4.071 Volts * (2,720 Milli-Amps / 1,000) = 11.07 Watts. As Quick Charge 3.0 allows both voltage and amperage to be dynamically adjusted for optimum charging, it’s not uncommon to see charging speed vary depending on a variety of factors. In ideal conditions (low battery, low CPU load, screen off, etc.) 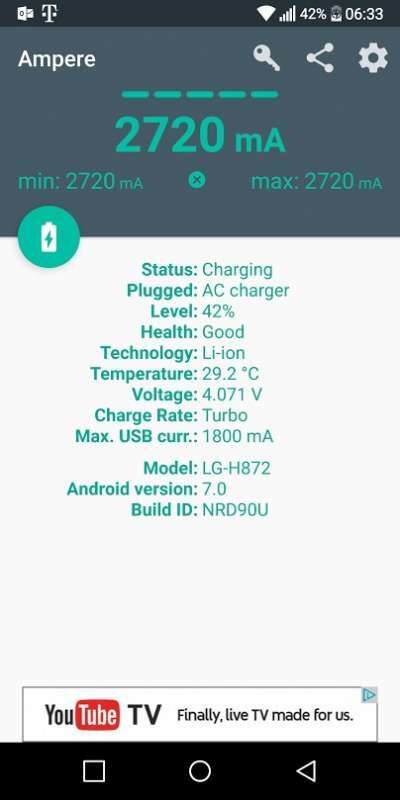 the maximum charging rate should be somewhere near 18 Watts for a device supporting Quick Charge 2.0 or Quick Charge 3.0. 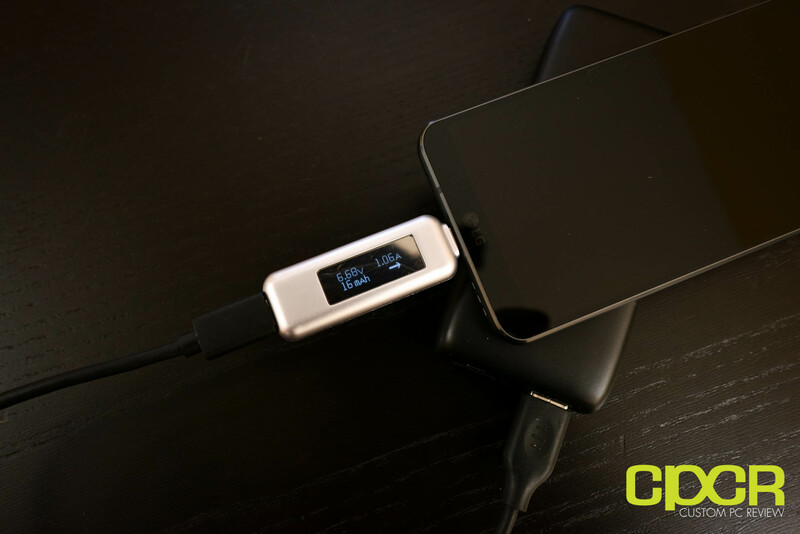 For devices that only support standard USB charging such as 5 volt, 1 amp or 5 volt, 2 amps, the charging speed should be somewhere near 5 watts or 10 watts respectively. For those who don’t like to utilize an app, or want a more real time method of measuring charging speed, a USB power meter can be a quick and easy way to accomplish this task. 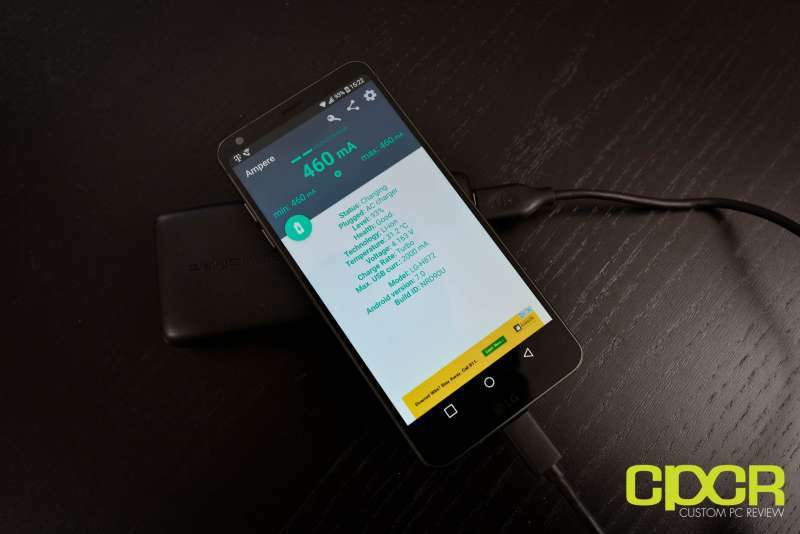 Since our device is USB Type-C we’re using the Kurrent USB Type-C Power Meter to measure the amount of power the smartphone is drawing from the battery bank; however, USB Type-A power meters are also available online. To use the power meter, simply connect the power meter between the USB cable and the smartphone. Information about the charging rate should automatically be displayed. Similar to using the Ampere app, to find the amount of wattage being charged into the smartphone, simply multiply voltage by the amperage. In this case, 6.68 Volts * 1.06 Amps = 7.08 Watts. One major benefit of using this method is that it’s much easier to check the amount of power being charged into the device with the screen off. While this makes no difference in older devices, newer devices with support for Quick Charge 3.0 and likely other newer fast charging standards will generally lower voltage and amperage when a device’s screen is on to reduce the amount of heat generated. An added bonus for some power meters is that they also offer the ability to measure the amount of power traveling through the meter which allows for some interesting testing such as figuring out the maximum battery capacity in a power bank for example. These are two very simple methods to obtain the charging rate for an Android device. Of course, those with more advanced skills can always splice an extra USB cable and tap into the cable using something like a multimeter for more accurate measurements. What are your favorite methods of finding out how fast your device is capable of charging at? Let us know in the comments below!